Fewer than one in four newly-appointed maths teachers in England are regarded as "good appointments" by the schools taking them on, a survey suggests. More than a fifth of maths teaching posts are unfilled and almost as many are occupied by people not trained as maths teachers. The survey was undertaken by the National Association of Mathematics Advisers with the Open University centre for mathematics education and King's College London. A total of 228 schools in 22 local education authorities responded to the survey, employing 1,571 teachers of mathematics. Of those, 17% were found to have no training in teaching mathematics. A further 6% had "weak" qualifications, having been trained only in a related subject. A one-day conference at the centre heard that the national picture was patchy, with "grave" shortages in some areas and, in others, positive responses to recruitment advertising. 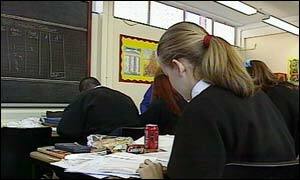 Of the schools surveyed, a quarter said they had advertised for three or more maths teachers last year. Some had tried to fill as many as six posts. Some reported having had no responses to national advertisements. A total of 22% of posts were not filled. The conference organiser, Sue Johnston-Wilder, said the shortages were part of a vicious circle, as fewer students took mathematics beyond the age of 16, when it ceased to be compulsory. The problems have been compounded in the short term by the notoriously difficult new maths A-level syllabus, which saw a high failure rate in the AS level in 2001 and a consequent drop in the numbers taking the A-level last year. On Thursday, the Qualifications and Curriculum Authority (QCA) published revised subject criteria for AS and A-level mathematics. But it will not be taught until September 2004, with the first AS examination in 2005 and the first full A-level a year later. Sue Johnston-Wilder said the shortage of staff meant an additional "and overwhelming" workload for the more experienced and qualified teachers. The survey also suggested that experienced, qualified maths teachers were leaving for reasons similar to those highlighted in a survey published earlier this week by the General Teaching Council. These were workload, indiscipline and a lack of room to be "creative" in the way they taught their subject. She said other research showed they felt constrained partly because the teaching guidance from the Department for Education and Skills was too prescriptive - being aimed at supporting teachers who were not maths specialists. One in 10 of the maths teacher appointments involved people that schools said they would not normally "touch with a bargepole" but had hired because they had to fill the post, she said. The department said in a statement that, according to Ofsted, schools now had the best teachers they had had in a generation and the number of teachers leaving the profession for reasons other than retirement was falling. "Over 98% of maths teaching posts are filled, the vast majority by fully-qualified maths teachers," it said. "The introduction of training bursaries and 'golden hellos' is bringing more maths graduates into teaching. "Recruitment to training in maths this year is 8% higher than last year and 30% higher than it was in 1999/2000."